Cons • Huge up/downlink imbalance in simultaneous throughput test. 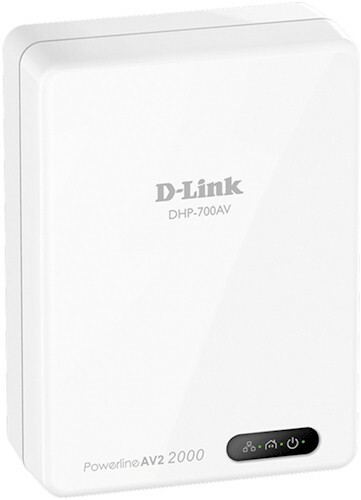 There has been some excitement about D-Link's DHP-701AV "2000 Mbps" HomePlug AV2 adapter due to the largest number yet on a powerline product. But it's yet another case of over-zealous marketing to too-gullible consumers. As the good ol' HomePlug AV2 profile chart trotted out in previous reviews shows, the top AV2 profile is only 1.5 Gbps. Broadcom HPAV2 SISO device can use a bandwidth of up to 84.3 MHz (from ~1.8 MHz up to ~86.1 MHz). You'll see shortly that performance is nowhere near 1000 Mbps, let alone 2000 Mbps. The DHP-701AV is fairly large as current-design powerline adapters go. The photo below provides an idea of its 3.89" x 2.86" x 1.34" profile and shows it won't block the adjacent outlet in a standard U.S. duplex. The serial number label specs a 100 - 240 VAC 50/60 Hz operating range. Note the photo shows the individual adapters are labeled DHP-700AV. The callout diagram below shows the adapter supports tri-color HomePlug link quality indication. The single Gigabit Ethernet port is centered on the bottom of the adapter, with the Reset / Encryption button sitting to its left. Waited until the Ethernet unplugged DHP-701AV entered power-save. The DHP-701AV kit is the first appearance of the second HomePlug AV2 device Broadcom announced over a year ago. The inside photo below clearly shows the BCM60500, which is coupled to the sheet-metal thermal spreader in the top cover via the thermal pad stuck to the spreader. The plastic case has only a few measly vent holes on the back of its case. The case got moderately warm to the touch. I tested the DHP-701AV using our standard powerline test procedure, with all results entered into the Powerline Performance Charts. Since there are no other AV2-M1500 class products in the charts, I decided to compare the two MIMO AV2-M1000 class products tested so far, TRENDnet's TPL-420E2K and ZyXEL's PLA5405KIT. This will show whether the additional 20 MHz of bandwidth the 1.5 Gbps MIMO AV2 profile uses does any good. The Downlink Throughput plot below shows the DHP-701AV having the highest throughput only in Location C. Both AV2-M1000 class adapters spank the D-Link in the same outlet Location A test. Looking at the composite IxChariot downlink plot shows the culprit: high cyclical variation. The variation is also there to a lesser extent in the mid-range Location C test. The DHP-701AV turns in its best performance on Uplink in Location C again, soundly beating the other two products. But in the best and worst case test positions A and E, the margin over the other two products slims considerably. The 401 Mbps in Location A is the highest measured result from the D-Link. The IxChariot plot shows the cyclical variation is basically gone. The rise at the beginning of the tests is IxChariot's Nagle's algorithm quirk we see all the time in 802.11ac wireless tests. The simultaneous up /downlink IxChariot plot for the DHP-701AV shows a huge mismatch in the two directions, with a definite preference for uplink (transmit) traffic. I observed the same behavior testing the ZyXEL PLA5206, which uses Broadcom's AV2 SISO device. The 391 Mbps total is better than the 308 Mbps the ZyXEL produced, however. Adding more simultaneous streams gained another 70 Mbps or so for 466 Mbps of total throughput. This is much better than the 327 Mbps total the ZyXEL yielded in the same test. The noise tests run in Location E showed the DHP-701AV reacts quickly when a noise source is removed, but doesn't otherwise adapt. The light green bottom trace shows throughput with a noise source plugged in for the duration of the test run. There's basically no increase in throughput over the run, which indicates the adapter isn't working around the noise. If it had, we should expect to see throughput move up on the bottom trace. I didn't use the Powerline Ranker to sum up, because the DHP-701AV currently stands alone in its AV2 MIMO-1500 class. So let's look at the Powerline Charts' average down and uplink values for all AV2 MIMO products. For downlink, TRENDnet's TPL-420E2K kit is the clear choice with 17% higher average throughput than the DHP-701AV. For uplink, however, the tables are turned with the D-Link averaging 18% higher throughput than the TRENDnet. Keep in mind, however, the TRENDnet is currently in very limited supply (basically, remaining stock from the first manufacturing run) until TRENDnet solves a problem affecting medium and long distance performance. In the end, the choice for best powerline adapter is tough right now. Like Wi-Fi products, you'll see highest throughput only with noise-free lines and adapters in the same or next room—not your typical conditions. The D-Link's biggest strength is that its throughput doesn't fall off as much in our mid-range Location C as other adapters tested. But what that translates into in your setup can only be determined by trying it. If it were my money, I'd use the Location E worst-case downlink results shown below to choose. The best bangs for the buck look like the ZyXEL PLA5206KIT, PLA5405KIT and TP-LINK TL-PA6010KIT. They all produce over 100 Mbps of throughput and cost under $100 for a pair.